Camelina is also known as Siberian oilseed, gold-of-pleasure or false flax. An oilseed crop that grows well on marginal land, but will not thrive on wet or poorly drained soils. Small, round pea-sized seed pods turn golden, each pod containing quite a few seeds. Camelina's oil is high in omega 3's, is extremely stable and can be used as a cooking oil, lamp oil or in animal feed. It can comprise up to 10% of chicken and cattle feed. Broadcast seed and cover loosely with soil as soon as the earth can be worked in spring. Seedlings are very frost tolerant. 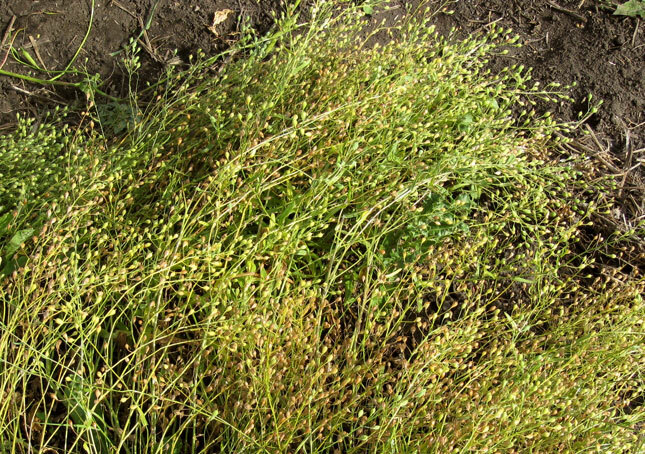 Camelina grows 12 - 36 inches tall. Harvest seeds when pods turn golden.